Fairly pleasant locals pub with one large bar and what seemed like a smaller room at the rear to one side. There is a nice garden at the same side. The landlord appears to be Northern Irish. 4 ales were on - Weltons English Pride, Adnams Bitter, Timothy Taylor Golden Best & Twickenham Summer Sun. I tried the Weltons, which wasn't up to much. European Championship football was being shown on the TV. Makes a change from some of the local Fullers pub and I thought the ale range was similar to the nearby Riflemans. But for the best selection, head to the Sussex Arms. 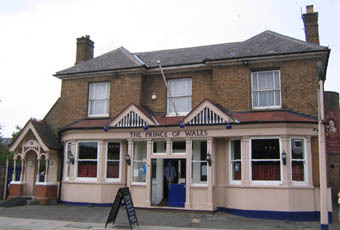 Large and traditional pub not far from Twickenham Green. A nice range of beers on - Ringwood 3.60 a pint - and also a good food menu (not tried). Garden is very pleasant. Great pub surprisingly close to The Rifleman and also, conveniently, to Strawberry Hill station. Friendly staff who know their beers and of course are also knowledgeable about other local pubs - but without being over-competitive. Plenty of places to sit and enjoy one or more of the selection of (3) real ales on offer. Gents' toilet is under-lit when there's no natural light through the windows; not sure why!